I don’t know if this qualifies as breakfast for dinner. I guess it’s more like eggs for dinner that could also work for lunch… or breakfast? Either way, it’s quick and my favorite way to poach eggs. This technique was developed by Juan Mari Arzak, and is known as an “Arzak egg”. The first time I saw this method was watching season 1 of Mind of a Chef. 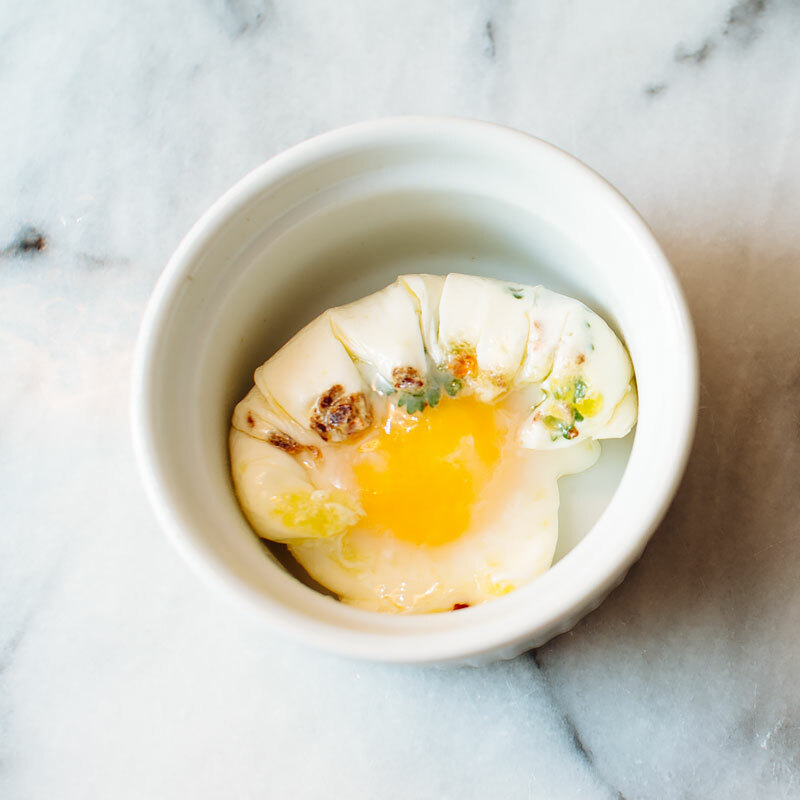 I’m obsessed with eggs in general, but seeing eggs poached this way pretty much blew my mind in a “duh, this makes so much sense but I would have never thought of it” kinda way. In a sense, this is a very low-tech version of cooking “sous vide“. Look at all the fancy new terms you can use to describe how you cook eggs now! 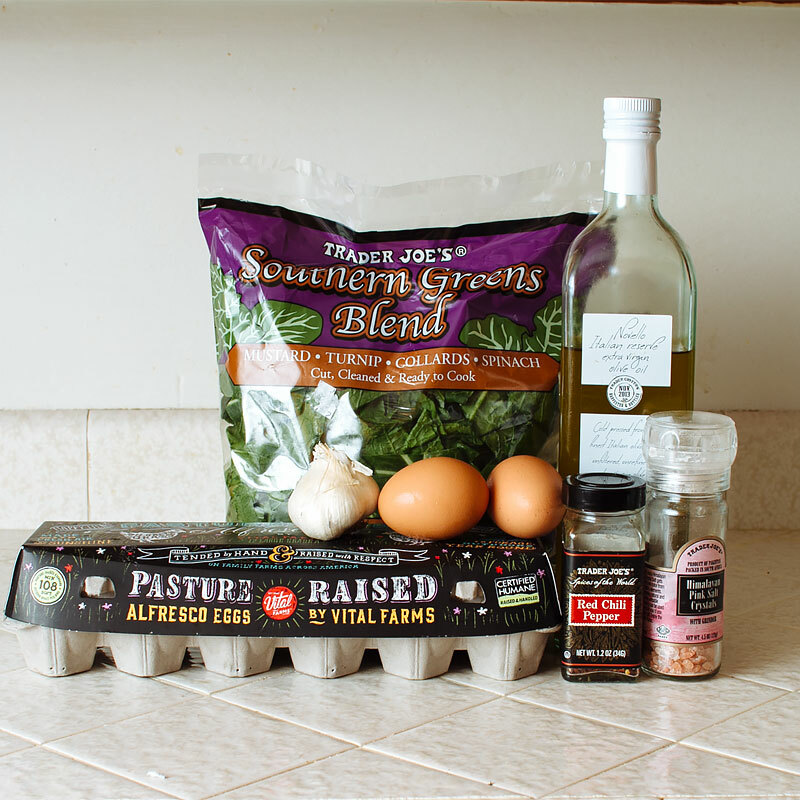 A note on eggs: I prefer pasture-raised eggs like the ones from Vital Farms. Yes, they’re a bit more expensive, but when you see, and more importantly, taste the difference in quality, you’ll never go back. Also, if you can spend $5 on a latte, you can spend a couple extra bucks on some super delicious eggs. Just look at the difference in yolk color! One of these eggs was a reg’la grocery store egg, and I bet you can totes tell which one. You’ll need eggs, roughly chopped greens (I’m using a blend of mustard, turnip, collards and spinach), olive oil, chili flakes, garlic, sea salt and some lemon (not pictured). 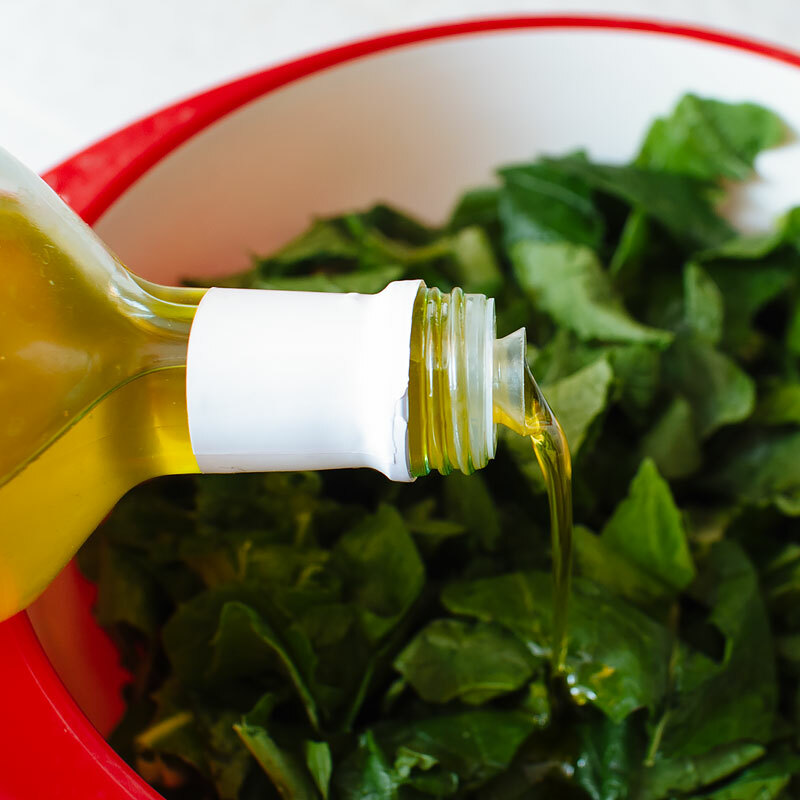 Drizzle the greens with olive oil to coat. 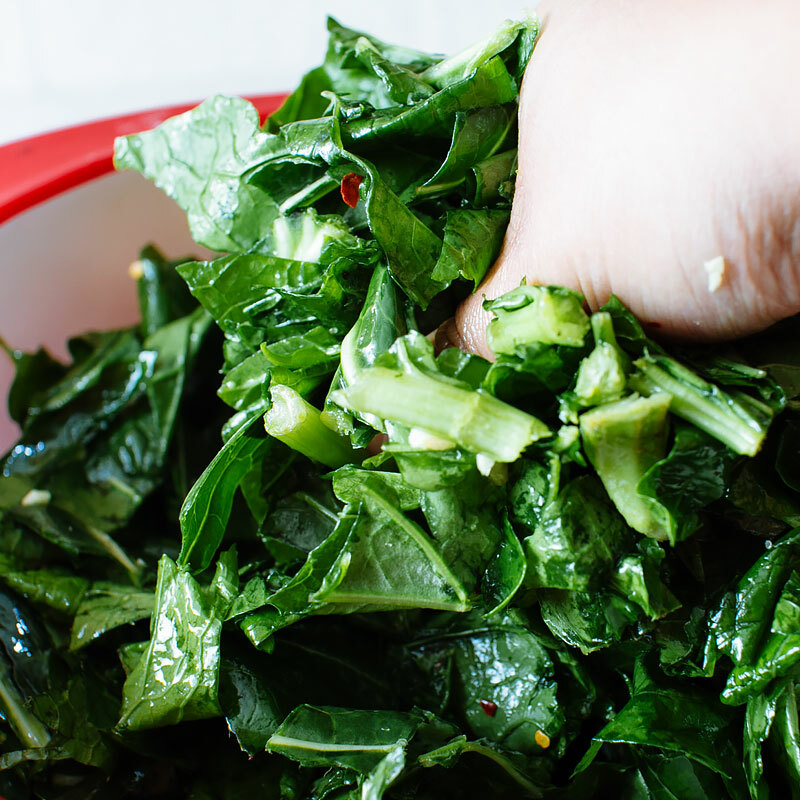 Massage the salt, garlic and chili flakes into the greens. 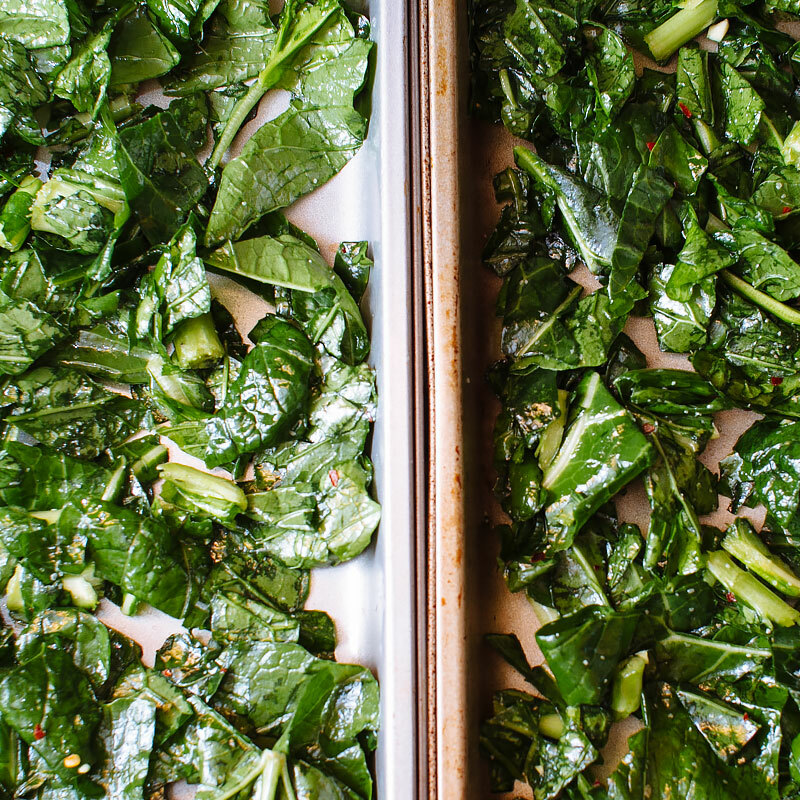 Spread the greens evenly over two baking sheets so that the greens are in a single layer. If you overcrowd the baking sheet, they’ll steam and never get crispy. We want crispy. Roast at 400F for about 15-20 minutes, tossing every 5 minutes until cooked through and crispy. While the greens are cooking, you can Arzak some eggs! Begin by taking a sheet of plastic wrap (about 10″x10″) and brush lightly with olive oil. 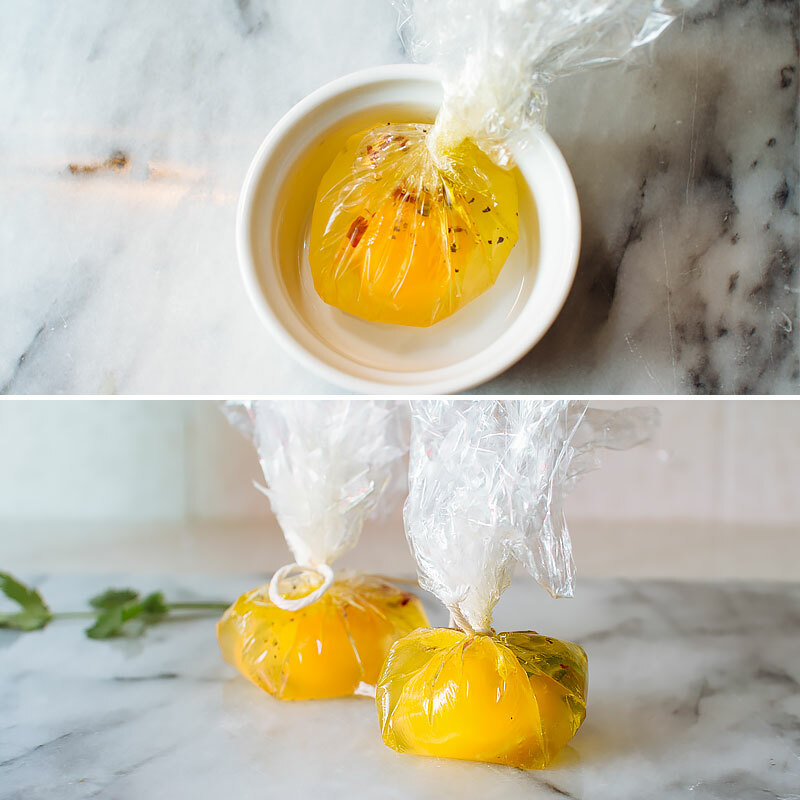 Place the plastic wrap, oil side up, into a small owl or ramekin and crack the egg in. Season with salt, pepper, a couple drops of olive oil and any other spices or herbs you’d like. 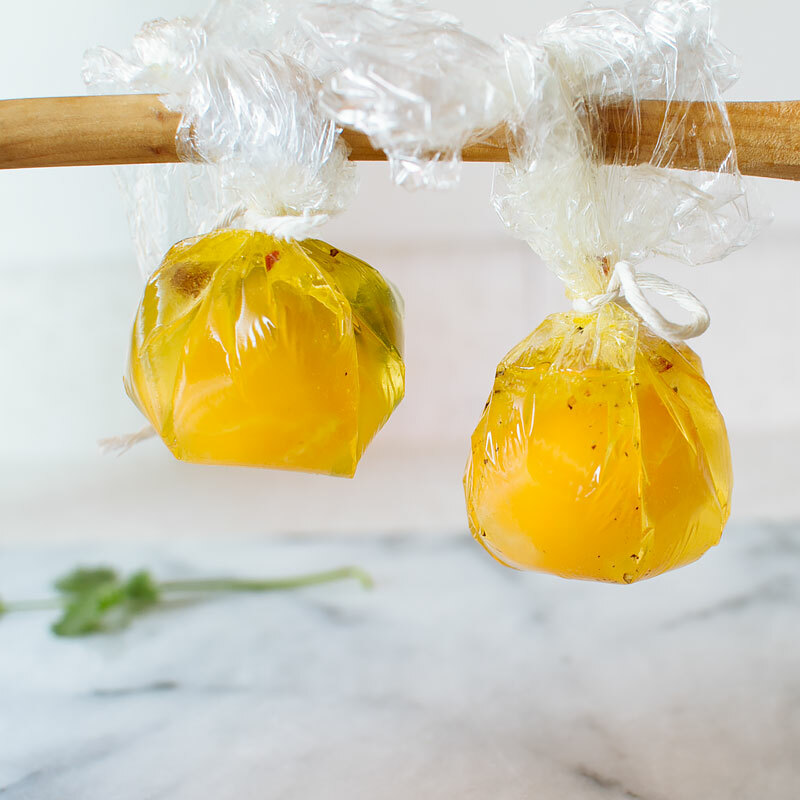 Twist the top to seal the egg in the plastic wrap, taking care to squeeze out any air bubbles in the process. 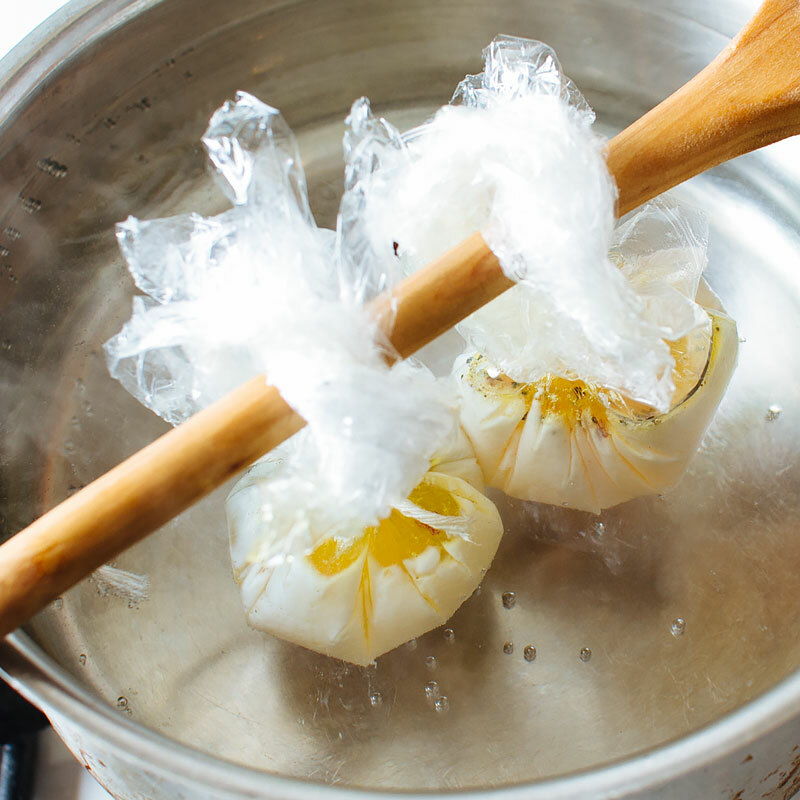 Use a piece of kitchen twine (or a rolled up piece of plastic wrap) to tie off. I like to tie the plastic wrap to a wooden spoon so they don’t get lost in the pot or sink to the bottom and overcook. Not necessary, just a precaution. Bring a pot of water to a simmer and gently place in the eggs. They should be completely submerged in water. Cook for 5-7 minutes, until whites are set and yolks are still runny. Annnnd the greens are done! Perfectly roasted and crispy. 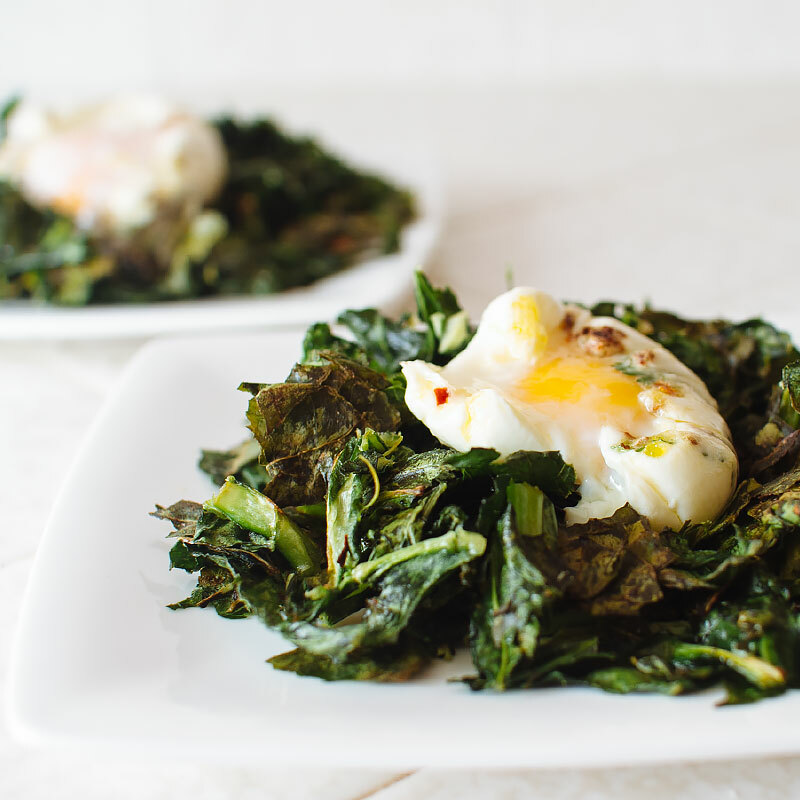 Serve the eggs over the greens and you have a perfect little meal. i heart eggs so much. 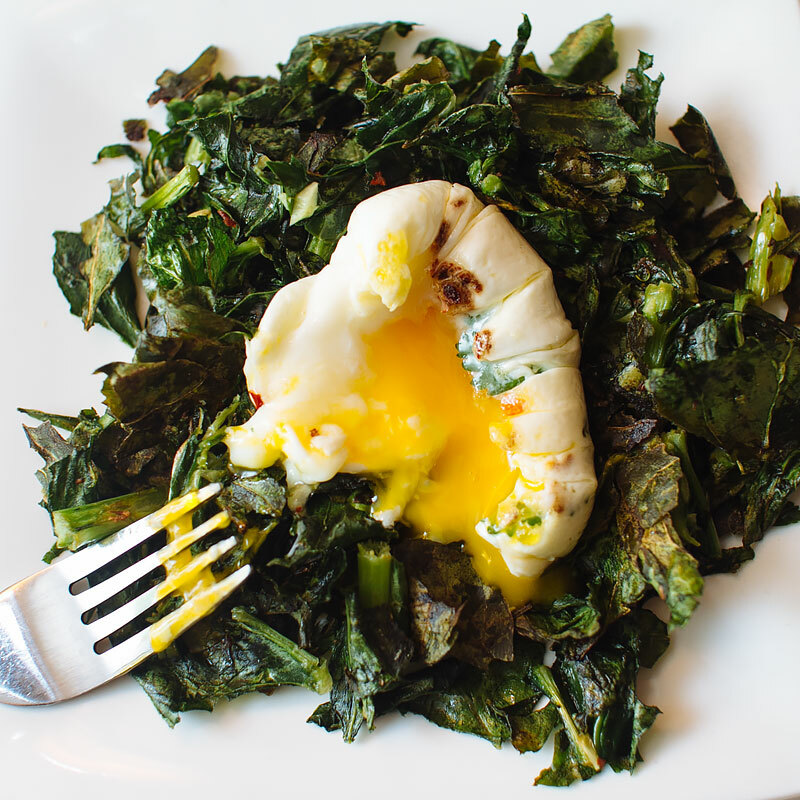 A great way to poach eggs! 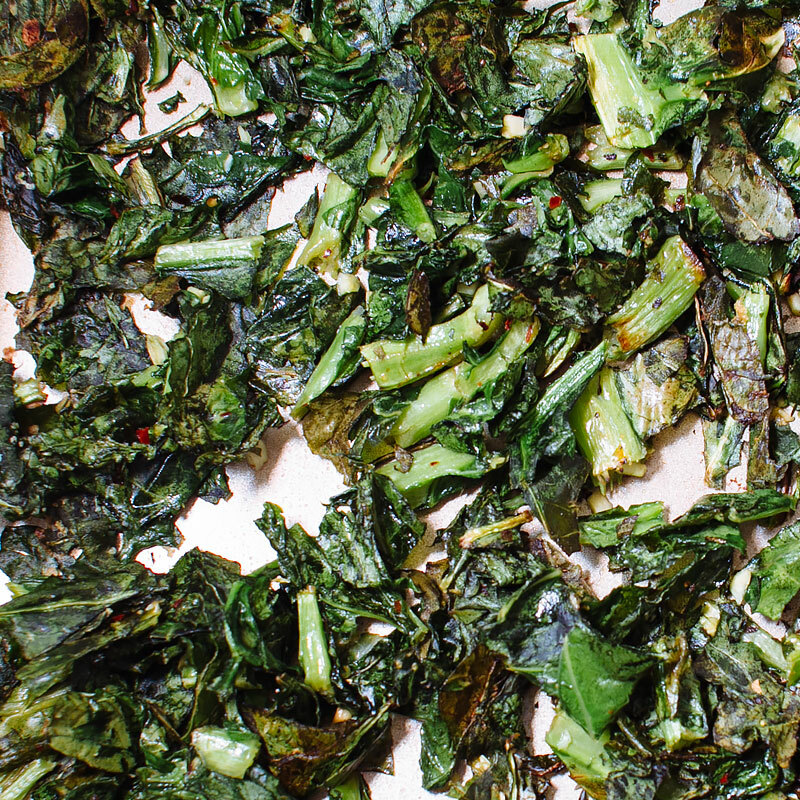 In a large bowl, combine the greens, olive oil, chili flakes, garlic and salt and pepper. Massage the olive oil and seasonings into the greens. Spread the greens in a single layer (you may need to use two baking sheets) and roast for 15-20 minutes, tossing the greens about every 5 minutes so they brown evenly. Cook until tender and the edges are brown and crisp. Squeeze a little bit of lemon juice over the greens, to taste. While the greens are roasting, bring a large pot of water to a simmer over medium heat. 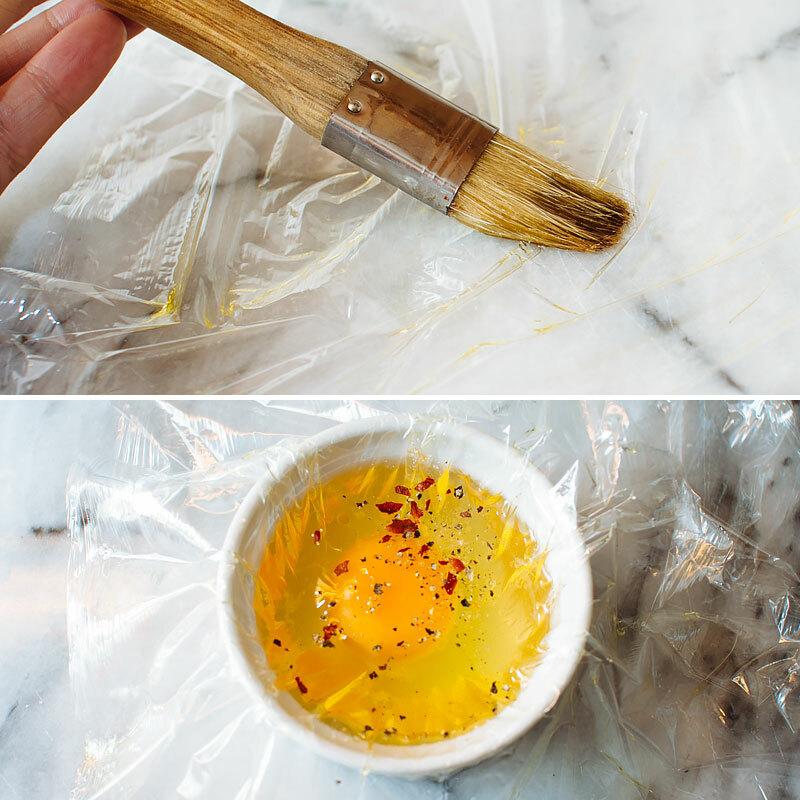 Brush a ~10"x10" piece of plastic wrap with olive oil, and place into a bowl or ramekin, oil side up. Crack in one egg and season with salt, pepper and any additional spices or herbs. Twist the ends of the plastic wrap together to create a little purse, taking care to remove any air bubbles as you twist. Tie off with kitchen twine, or a piece of rolled plastic wrap. Tie the edges to a wooden spoon long enough to fit over the pot without falling in. Place the eggs in the simmering water and cook 5-7 minutes, until the whites are set and the yolks are still runny. Remove from the water with a slotted spoon and remove the plastic wrap. 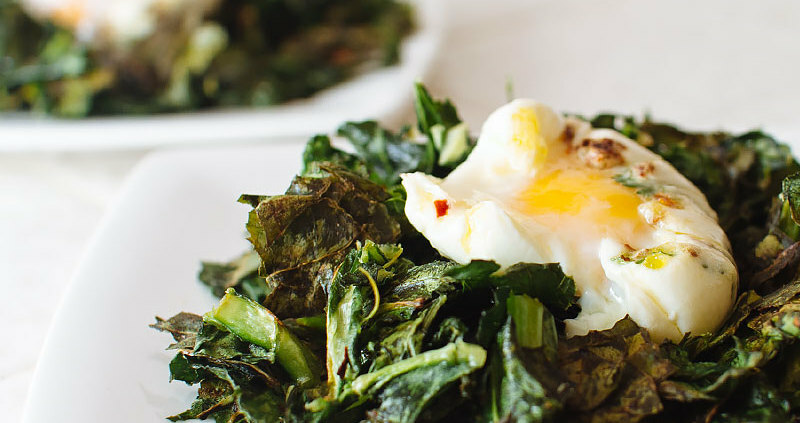 To serve, place the eggs over a generous pile of greens. Sprinkle with some crunchy sea salt and enjoy! You can use any type of hearty green for this recipe - just adjust cooking time accordingly.